One Pan Chicken and Squash Dinner - Let the Baking Begin! This One Pan Chicken and Squash Dinner is a simple baked chicken recipe with roasted butternut squash. A delicious roasted chicken thighs recipe with garlic, thyme, and paprika – One Pan Meal your whole family will enjoy! PIN this One Pan Meal recipe to your Pinterest board. Do you know why one pan or one-pot dinners are so popular? It’s because nobody likes doing dishes if they don’t have to. I’m guessing I’m not the only one that can think of other things to do instead of doing dishes. This One Pan Meal with Roasted Butternut Squash and Chicken Thighs is your ultimate fall comfort food recipe idea. All you have to do here is toss all the ingredients together, in no particular order, put in the oven and wait. Waiting is probably the hardest part of this recipe. I am telling you if you like squash – prepare to be amazed! 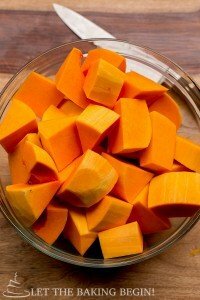 As the Chicken Thighs roast, the juices seep out and into the Butternut Squash permeating it with flavor. The garlic, thyme, paprika and a little kick from the pepper flakes makes this one pan meal wonder – well, absolutely wonderful! Whether you’re a seasoned cook or someone who doesn’t know your way around the kitchen, you can make this One Pan Chicken and Squash dinner. Can I make this Chicken Thighs recipe with chicken drumsticks? 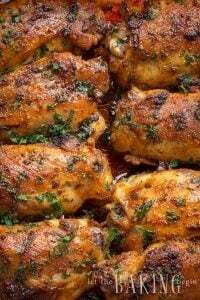 You may substitute the chicken thighs with drumsticks, you will just bake this dish for 5-10 minutes less. What do I make this One Pan Meal in? If you want your chicken thighs and butternut squash to be crispier use the large rimmed baking sheet. Or you can use a simple glass baking dish. Preheat oven to 375F with the baking rack in the middle. Line a jelly roll baking sheet with parchment paper. Combine all ingredients in a bowl or in the prepared baking pan. Toss everything together until all ingredients are coated evenly. Distribute everything in the large jelly roll pan. Bake in a preheated to 375 F oven for 1 hour. Increase heat to 425 and bake for another 10-20 minutes until the chicken is golden in color. Remove from the oven and serve 2 chicken thighs with about 8 pieces of squash per serving. Sprinkle with chopped parsley as a garnish if desired. What is your favorite vegetable to bake your one pan chicken recipes with? There are so many different ingredients you can make one pan chicken dinners with. I love using all kinds of ingredients. Such as potatoes, zucchini, carrots, and so much more. What do you use? 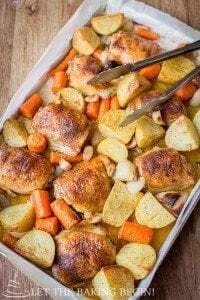 One Pan Chicken and Potatoes – Another simple meal your family will love! 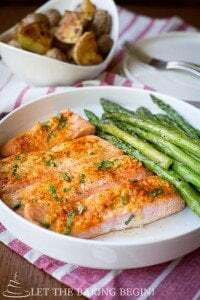 Potato Salmon and Asparagus One Pan Dinner – A clean and easy dinner. 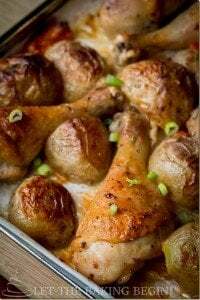 One Pan Meal-Baked chicken and Potatoes – Drumsticks with potatoes baked in garlic, paprika, and olive oil. This One Pan Chicken and Squash Dinner is a simple baked chicken recipe with roasted butternut squash. A delicious roasted chicken thighs recipe with garlic, thyme, and paprika - One Pan Meal your whole family will enjoy! Distribute everything in the jelly roll pan. Bake in a preheated to 375F oven for 1 hour. Increase heat to 425 and bake for another 10-20 minutes until the chicken is golden in color. Remove from the oven and serve 2 chicken thighs with about 8 pieces of squash per serving. Sprinkle with chopped parsley as garnish if desired. Delicious! I threw in 1/2 cup of cranberries that I needed to use up plus a few splashes of apple cider. Used boneless thighs and kept close watch in case they needed less time. Looks like you definitely know what you’re doing in the kitchen! That sounds delicious! Easy to make, and tasted great. Just I added some red onion for richer flavor. That’s a great idea! Slightly charred onions are my favorite! Made this for dinner tonight – it was super easy ( I used pre-cut squash) and delicious! Thank you for sharing your feedback Sue! We love this recipe! So easy and so delicious! When I first made this my husband was very skeptical and I could tell he wasn’t too excited about dinner until he tried it. The squash is phenomenal! Thank you Valentina! I’m glad you guys enjoyed this dinner! Is this for boneless chicken thighs or bone-in? Regarding the one-pot chicken and squash dish… One and one quarter TABLESPOONS of salt?? Yikes. Good recipe, but I’m wondering if that’s a typo. I plan to try this recipe soon, but I will use a lot less salt, like maybe a few sprinkles from my salt shaker..
Love your one pan dishes! They are always so delicious!